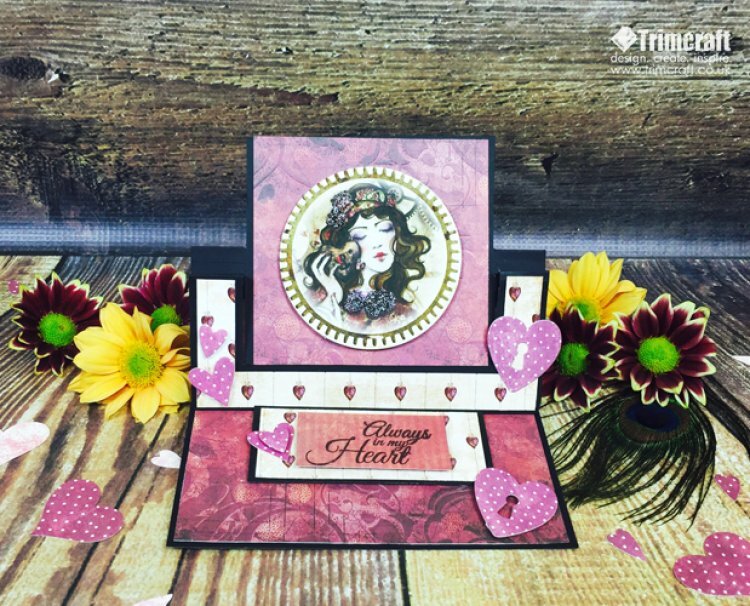 With our free printable template, you can add movement and dimension to your craft projects whilst learning a new cardmaking skill. 1. Print the free printable template and follow the instructions to cut, score and fold the black card blank. The template provided is to scale. 2. Cut a piece of the SANTORO®'s Willow burgundy floral paper to 13.5cm square and stick to the bottom of the card. 3. Cut two 1.5cm x 5.4cm strips of the distressed heart paper and stick to the folded frame. Cut a 1.5cm x 13.5cm to add to the bottom of the card. 4. Cut another piece of the SANTORO®'s Willow burgundy floral paper to 9.3cm x 9.2cm and add to the centre of the swinging square section with double sided tape. We have then added the ‘Mechanic of my heart’ character topper to the centre of the swinging square. 5. To create the stopper for the top section of the card, we have cut a black piece of card to 9cm x 3.7cm and stuck it to the bottom of the card, 2.7cm from the edge using 3D foam squares. Layer it with the distressed heart paper cut to 8.5cm x 3.4cm. 6. We have then stamped the ‘Always in my Heart’ sentiment onto the distressed striped paper and added to the stopper with foam squares. To decorate the stopper, we have cut a medium and small heart with the purple polka paper. Stick the medium heart to the left of the stopper and add the smaller heart on top with a foam pad. 7. We have then die cut two heart shaped locks, sticking one to the right side of the swinging frame and adding the other to the bottom right of the easel stopper using foam squares. To finish, die cut a medium and small heart and add to the left side of the swinging frame, again using foam squares for further dimension. Have you made any of our Card Shape of the Month projects? Remember to share and upload them on our project gallery.